What Animal Has Blue Eggs? Birds do it, and so do amphibians and some reptiles, a couple of mammals and numerous invertebrates -- they lay eggs. If blue-shelled eggs you seek, stick with the birds. Many species of birds lay blue eggs in shades ranging from the palest blue to deep turquoise. As eggs move through female bird’s oviducts, they become coated with pigments that will determine the color and markings of the shell. Also, a hen's age determines color density: Younger birds generally produce smaller eggs; as they age their eggs become slightly larger. The same amount of pigment is distributed no matter the egg size, so larger eggs from older birds are generally paler in color. Stress during the egg-laying process can affect color intensity. In some cases, egg colors camouflage the eggs. In other cases, the color helps the parents identify their eggs. This is especially true in cases where colonies of birds nest together. Here's an interesting fact: The shell color of freshly laid eggs can be rubbed away; but once the pigment has set, it is permanent and cannot be rubbed off. 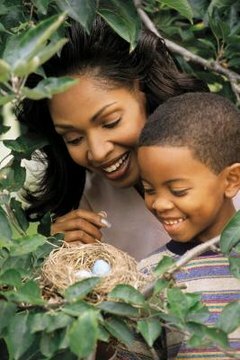 Blue birds, robins, blackbirds, starlings, blue jays, thrushes, catbirds and dunnocks are some of the species of songbirds that lay solid blue eggs or blue eggs with brown speckles. Though the blue color does not work well as a camouflage, it does help birds distinguish their eggs from those of interlopers, such as cowbird eggs. The South American Araucana chicken lays blue eggs. Since its introduction to North America, this chicken was crossbred with other chickens to develop a variety called Ameraucana. The Ameraucana chicken lays eggs in shades from light blue to green. Several species of ducks lay blue eggs that are favored by cooks around the world. These include cayuga ducks -- whose first eggs are so pigmented they appear black -- mallards and golden eyes. Ring-necked pheasants and some geese also have bluish colored eggs. Wading birds such as snowy egrets, great egrets, little blue herons, and great blue herons lay blue to blue-green eggs. Shore birds such as some terns guillemots, skimmers, cormorants and common murres also lay some blue eggs. Egg colors for these species often vary in color intensity and shade with some appearing more blue in color and other eggs more ivory. Erect-crested penguins lay two eggs but normally only raise one chick. The first egg is smaller and much deeper in color than the second egg. The second egg, which is larger, generally hatches first and therefore the chick from the second egg is larger and healthier by the time the first egg’s chick hatches. In some cases, the first egg never hatches. Scientists are still trying to determine why these penguins lay two eggs rather than one. Emus are also flightless birds. Their eggs are usually dark green to ebony, but occasionally they lay turquoise-blue eggs. Emu eggs are very large and are valued both as a gourmet food and for the shells, which are turned into works of art with delicate carvings and etchings. What are the Colors Parrots Can See & Humans Can't?